One Momofuku group meal is epic. Two is a feat. As much as I would have loved to try a third, I don't mind at all leaving the extra calories to a friend. 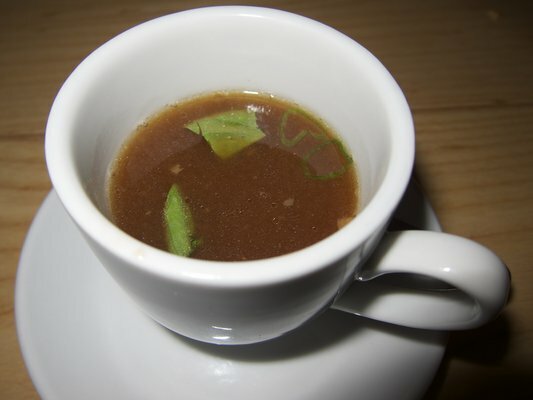 Here is Jocy Chang's take on Momofuku Ma Peche. 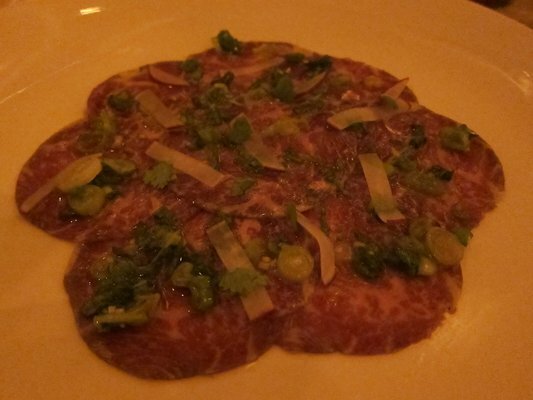 At Momofuku Ma Peche they have a beef tasting course menu for a set price of $450. The size of the party can range anywhere from 4 to 8 persons. 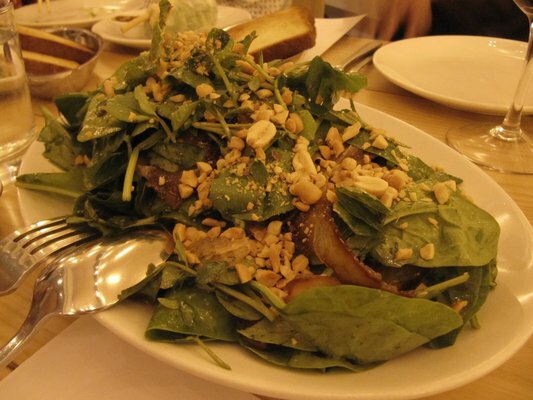 Overall, the perfect number is 6 persons if you don't order any other appetizers or sides. Our party was a size of 8, so we supplemented. Here was our 7 course dinner. If you are looking to partake in a Momofuku group dinner, the Bo Ssam may be your best bet as the fried chicken and beef 7 ways seems to underwhelm. If you are used to meals that really knock your socks off in terms of cooking style, ingredients, and presentation, then you will be slightly disappointed with the beef 7 ways. It sounds like a hit or miss. As Jocy reports, the Tendons, Ribs, Meat Pie, and Cote de Beouf were good but not standouts. 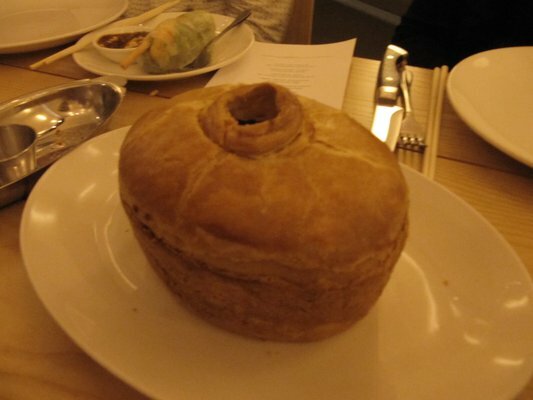 The tongue in the Meat Pie was overcooked and the Oxtail Soup was sweet. 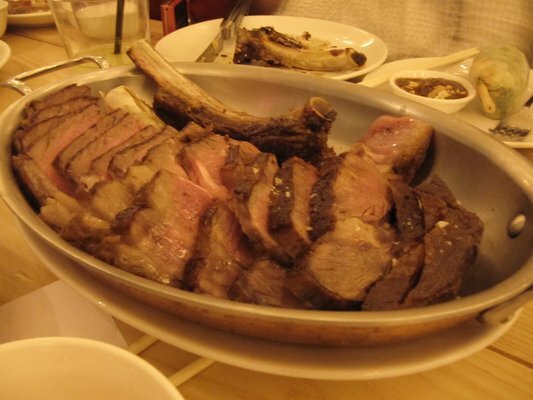 The Wagyu Beef and Brisket are the must get dishes. All these Momofuku group dinners probably have you wondering about the Momofuku Ko dinner. Momofuku Ko will not have a blog post since they do not allow cameras. Food posts without pictures are just not fun. I know. Wow. My friend wasn't joking when she said it was difficult to get a reservation at Momofuku. My family was in town and I thought it would be a great idea to have the fried chicken dinner at the Momofuku Noodle Bar. 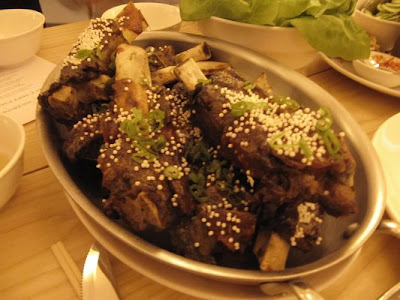 I had already tried the bo ssam dinner at the Momofuku Ssam Bar and loved it. I had also been coveting the fried chicken dinner for more than a year. Finally I had an opportunity to try it out. There are only a few reservations available per day and you must log in at 10 AM to snag a spot. 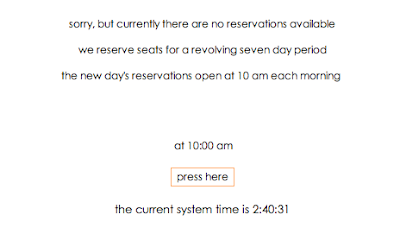 You can reserve seven days in advance but only if you are so lucky to get a reservation within a minute after the spots open. It's like a race and game of tic tac toe. The Os are actually check marks but just pretend they are Os. After a few tries, I finally got a reservation but for lunch and on a date where I had to take off from work. The fried chicken lunch was similar to the bo ssam in a few ways. It was served with sauces (hoisin, ginger scallion, soy garlic jalapeno, and sriracha) and bibb lettuce. The fried chicken lunch also came with radishes, baby carrots, and mu shu pancakes. The veggies taste incredibly fresh. I'm not a fan of raw carrots but I loved the baby ones they served. They were sweet, snappy, and were the perfect palate cleanser in between servings of chicken. There is a giant chalkboard in the restaurant that tells you exactly where the veggies came from. Here is the chicken cooked two ways: Korean and southern fried. It was quite impressive the way it was presented. Tastewise, not so much. After the bo ssam, it is a tough act to follow. Here is a sample of my open faced fried chicken taco. Momofuku definitely puts a new spin on fusion style cooking. Try the fried chicken but only once for the novelty. Try the bo ssam and try it again. The bo ssam dinner at Momofuku Ssam Bar was the first non a la carte meal I had at the Momofuku empire. I did not know what to expect. Momofuku limits this dinner to a party of 10. In actuality, it can feed a party of 15. No meal at Momofuku should ever go without the steamed buns. It's unlike any other pork bun you have had elsewhere. Ippudo runs a close second but there is nothing like the Momofuku one. I've had it a few times now and it has come down to being a hit or miss. I still hold on to the memory of the first time I had it when it was amazing with a huge slab of pork belly slathered with hoisin sauce, a slice of cucumber and slivers of scallions for bite. The bun was fluffy and soaked up all the fatty goodness and salt of the hoisin sauce and pork. Here is the kitchen hard at work. Our table had picnic benches and was right beside it behind the Momofuku Milk Bar. The Milk Bar has since moved across the street and Ssam Bar now has extra seating and party room space. The kitchen hard at work. The bo ssam comes with bibb lettuce, oysters, rice, kimchi, sriracha, and ginger scallions. You can eat the bo ssam solely with the rice or you can assemble everything together to make a taco like concoction. When the oysters reached our table, we immediately reached out for them. The server told us not to eat them on their own for the proper way was to put an oyster into our bo ssam taco. Dinner foul! Here is the bo ssam fresh out of the oven. It is a whole pork shoulder slow cooked. The meat just fell apart. The portion probably weighed about 5 pounds. And this is how we ate it. The whole thing just works. I highly recommend the bo ssam dinner. I would just go with a full party of 10. We had nine people with us and walked out with leftovers good enough for 3 more meals. 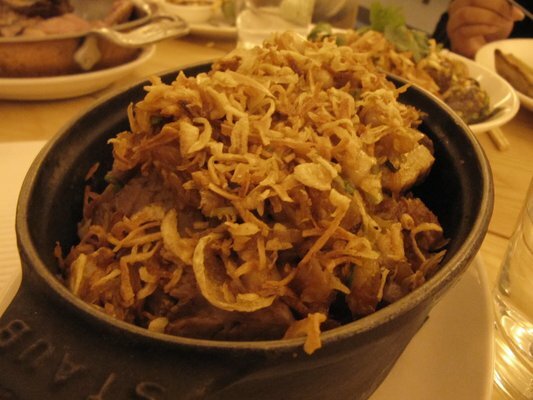 The meal is definitely an experience and the ambiance makes for a fun casual night out with the gang or family. And then you can tell everyone you had a bo ssam taco. No, this is not a food post. It's 1:57 AM. Do you know where your rat is? I came across a mouse recently in my apartment. If you live in New York City, you will inevitably encounter some sort of creepy crawler such as a cockroach, a mouse, or even worse, a bed bug. Thankfully, this post is not about bloodsucking inhabitants. It is, however, about a mouse (or shall I call it a rat?) that no longer exists. I once heard a rumor that vermin outnumber the people in New York City. I wouldn't be surprised if it were true. For every one human being born, a hundred vermin are let loose. Don't quote me on that. Here are a few things I have learned in the past few weeks from my own mousy visitor(s). 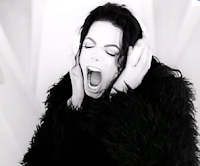 No, this is not about Michael Jackson even if the squeaky voice you hear makes you do the moonwalk. I marched into Home Depot looking for mouse traps. One whole shelf was sold out and every time I returned there was already someone in the aisle buying an armful of poison and traps. I took comfort in knowing that I was not the only one with a vermin problem. 2. Where there is a will, there is a way. Yes, this is about goals. The goal? Catch the mouse! There are a variety of traps available to get the job done. I had received an array of advice from friends on how to deal with this problem. Good old fashioned wooden traps are best but if you want to be cruel (so I've heard) glue traps ensure a slow and tortuous death. As I stood in the aisle of Home Depot, I near fainted at the thought of picking up a trapped mouse. I ended up getting a variety of traps- glue, mouse houses, and a slightly upscale plastic trap which my friends describe as looking like a miniature Japanese toilet for Barbie. 3. There will be signs. Sure enough, the next morning I found my kitchen counter sprinkled with mouse droppings. 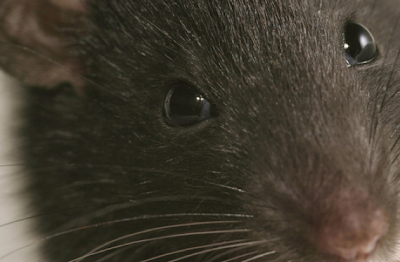 Mice will also sometimes leave marks from the oil on their feet. 4. Mice are creatures of habit. I thought back to sophomore year of college. We tried to lead a mouse through a maze in Biology. Mice have poor eyesight. That is why they crawl along walls. They will also scurry away or freeze if they get startled. I knew my mouse would be afraid of me. For sure it would hide or run away into one of my traps. The complete opposite happened. The mouse ran towards me and darted in a zig zag motion. Eeek! Everything I had learned in school was wrong! This mouse was fearless. It then ran away into the dark and onto the glue trap. I heard it wrestle with the trap. I was relieved that I caught it. I gave it a few minutes before I went to dispose of it. I was so puzzled when I looked and the mouse was nowhere to be found. Some mice are strong enough to fight off a trap. I gave up on the glue traps and invested in more fancy plastic traps. 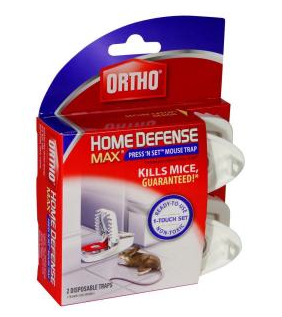 Ortho makes inexpensive 2-packs of traps that are convenient for disposal. Once a mouse is trapped, you can lift by the trap's tab and never even touch the mouse. I am a big fan of this style of trap. 5. They don't die, they multiply. Did you think Bebe's Kids were cute? I didn't. I thought they were annoying and I feel the same way about mice. My first catch snowballed into a pattern of catching one mouse daily with a break on the weekends. Where did the mice go? The Hamptons? I pinpointed the origin of the problem. There is construction on the building next door. When the construction stops on the weekends, the mice do not disperse. I am now in the process of professional extermination. As a renter in New York, this service is provided by my building. I am comforted by the belief that this problem is only temporary. Let's play a game. Finish this sentence. This burger is so good it ___________. Just fill in the blank to describe how the best burger you have ever tasted in your life changed your life. Yes, I know it is a bit silly to proclaim food revelations but sometimes food can make a statement or at least make you stop for a minute to really enjoy the presence of life. 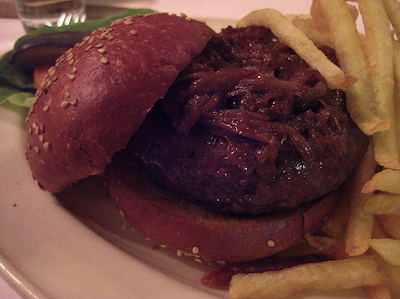 I went over the fill in the blank sentence a few different ways just to stress how good Minetta Tavern's Black Label Burger is. Folks, I am talking about the $26 Pat La Frieda burger. It's worth every dollar and is the best burger I have ever tasted so far. I thought it was so good that I promised my friend's husband that I would forgo all cheap meat burgers for a year just to justify the cost and to prove to him that it was a burger worth waiting for. GUESS WHAT? : I failed. I lasted 7 months. I hadn't had a meat burger since November 2010. I don't crave red meat so this was not particularly hard for me to do. But my friends were in town last month and we had stopped in at Mark to kill some time before dinner. This bar's specialty was sliders. Everyone ordered sliders and there were no meat substitutes. Fries, which were on the menu, would not be a stand in for my burger. I caved. I am weak. I realized how hard it is to be a vegetarian in NYC. I am a whiner. Sue me. So before I continue rambling on, here is the burger that broke my streak and it was PRETTY DAMN GOOD. Juicy, charred, and topped with bacon, onions and cheese. The bun had grease on it. I added jalapeno, chipotle, and barbeque sauce to it for some spice. GAME OVER. Heaven is all about now.